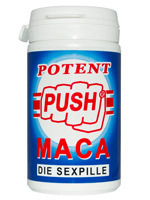 macapowder 400 mg, guarana powder 100 mg, vitamine E 7 mg, capsule (hard gelatin with dye titandioxide). Take 1 capsule a day with sufficient water. Do not exceed the recommended daily serving.